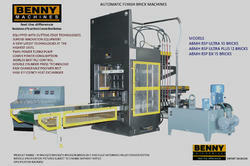 We are the supplier of "Automatic Fly Ash Brick Machines- Model: ABMH-8SP" from Coimbatore, Tamil Nadu, India. We offer quality Automatic Fly Ash Brick Making Machine- Model: ABM-6 used for manufacturing Bricks of different sizes from Fly Ash. 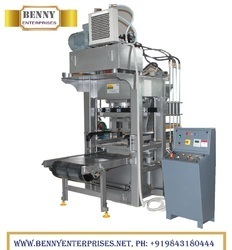 We offer these machines in Customized types as per specified requirements of our Clients. Brick Size 230x110x75mm, No: of Bricks: 6, Stork time 10 seconds 6 Bricks, Calculated Production per hour 2160 and for 8 hours 17280, in 80% efficiency production 13,800*,working pressure 80tons. Free fill Hydraulic System. Conveyer belt Brick ejection system. Hard Chromed Guide Rods. Hydraulic Power House: 250 liters of oil capacity. With Water Cooling device. Economic Package: Pan Mixer 250kg, Conveyor, Wheel Barrow - 2, Hydraulic Pallet Track: 1. Total Power - 27HP. 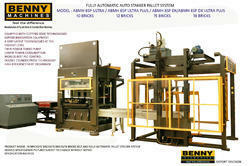 We are the suppliers of "Automatic Fly Ash Brick Machines- Model: ABMH-8SPDX" from Coimbatore, Tamil Nadu, India. Made up of Hydraulic Motor :15 H.P, Agitator Motor :5 H.P. We also have Hi-tech improved New Design, Long Lasting International standard equipments.